— Daily Freeman-Journal photo by Anne Blankenship The concrete medians will stay in place when the city moves forward with rebuilding the intersection of Fair Meadow Drive and Superior Street, following a split vote by the City Council Monday night. The concrete medians at the intersection of Fair Meadow Drive and Superior Street that are despised by at least some residents will remain in place when the road juncture is rebuilt this year. Councilmen Matt McKinney and Brian Miller voted with Hawkins to keep the medians in place. Councilmen Jim Talbot and Logan Welch voted against keeping them. The vote to keep the medians came after the council rejected a bid by Welch to take them out. The council also received documents presented by Connie Evans, of 1620 Juanita Court, which she said were signed by almost 560 people who wanted the medians removed. “This is not a fair poll by any means because you didn’t explain the changes to the intersection,” Hawkins said to Evans. Monday’s council vote cleared the way for engineers to prepare the final specifications for the intersection overhaul. Hawkins said the city will soon seek bids from contractors interested in doing the work. He said construction is expected to begin this summer, and if all goes well it will be completed by the end of this year. 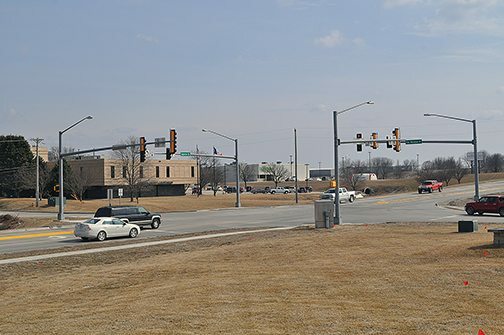 The busy intersection will be reconfigured to handle expected additional traffic created by the construction of a new Kwik Trip convenience store on Fair Meadow Drive west of the intersection. Kwik Trip has committed to paying $412,800 to help pay for the intersection improvements. The total cost of the project has been estimated at $613,900. Early in Monday evening’s discussion, Evans presented the council with 33 pages which she said contained the signatures of 561 people. She said all but three of those people said they wanted the medians removed. Hawkins wasn’t the only elected official who seemed skeptical of the papers. Talbot said he received 40 comments on the medians on his Facebook page. “Virtually everyone wants them out,” he said. He said paint on the pavement and rumble strips would serve the same purpose as the medians. Miller said removing the medians would cost about $142,000. “It does not make sense to spend more than $100,000 to remove a safety feature,” he said. Welch made a motion to remove the medians. That motion was defeated on a 3-2 vote. Hawkins, McKinney and Miller voted no. Talbot and Welch voted yes. Then Miller made a motion to keep the medians. That passed on a 3-2 vote, ending the debate.